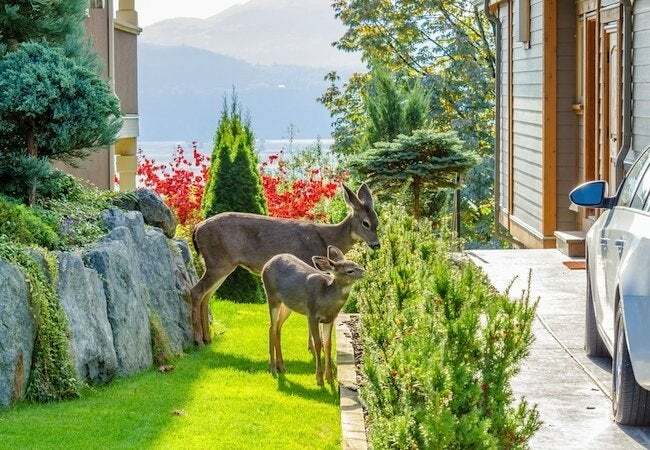 While enchanting to look at, deer are the nemesis of the home gardener. 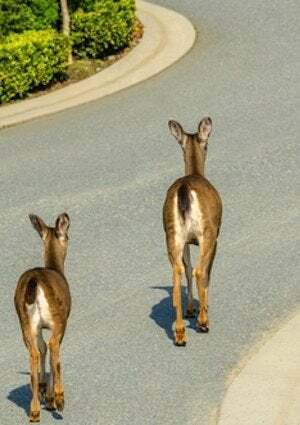 If you are wondering how to keep deer out of your garden this summer, consider one—or more—of the recommendations detailed here. Though deer look innocent, home gardeners know they can be a menace to plants and trees. Gardeners also know that barring Bambi from the backyard is never an open-and-shut case. For one thing, deer are talented jumpers, able to surmount any fence less than eight feet tall. Through the years, however, savvy green thumbs have figured out a variety of effective ways to keep deer out of the garden. One—or a combination—of these tricks may be the solution you’ve been seeking. Yes, deer have favorite foods. In particular, they love fruit trees, ivy, and high-protein crops like peas and beans. So one way to keep deer out of the garden is not to grow any of the species they like to snack on. But if you truly love and wish to grow any of the same plants that deer love and wish to eat, then position those varieties closer to the protection provided by your house. At garden borders, aromatics like lavender, mint, or garlic can help mask the scent of the sought-after plants in your beds. Also, note that deer dislike picking their way through bushes with thorns, so consider lining the perimeter of your yard with prickly vegetation. For many homeowners, building an eight-foot fence around the property to deter deer likely seems like overkill. But if you have other reasons to consider a fence of such size, be it privacy or security or both, then the side benefit of wildlife deterrence might make the construction worth it. Bear in mind that ideally the fence should be opaque, so deer cannot glimpse the treats beyond the barrier. If you have a smaller fence, you can make it a better deer deterrent by attaching chicken wire to the top and tilting the mesh at a 45-degree angle in the direction from which the deer would be coming. Of course, it’s not strictly necessary to fence off your entire property. Netting (or another equally manageable obstacle) can go a long way toward preventing deer from disrupting your vegetable patches or young, delicate seedlings. Also worth considering are motion-sensitive sprinklers; deer don’t like this sort of surprise! At night, motion-activated lights are effective for the same reason. • Because deer are not fond of hot spices, you can bring safety to your plants by treating them with a homemade chili spray. Simmer a pinch of red pepper flakes in a pan of water, then strain the liquid into a spray bottle. • At your local home center, keep an eye out for repellents containing, among other things, the urine of wolves, coyotes, or any other natural predators of deer. Be sure to follow the spray manufacturer’s instructions closely. • Scatter human hair near your plants, or stuff an old sock with hair and hang it from a fence post. Deer are naturally shy and leery of dangerous situations, so they’re unlikely to approach if they sense people are nearby. • If you own a dog, let him out into the yard as often as possible. The pet’s scent, which lingers long after it’s gone back indoors, can usually be counted on to keep even the most reckless deer at bay. Keeping out deer is not an exact science. An approach that works wonders for one homeowner might fail miserably for another. Try several of the possibilities outlined above and determine which are most effective in your area, then remember to mix up your chosen strategies, keeping the deer on their toes and out of your garden!